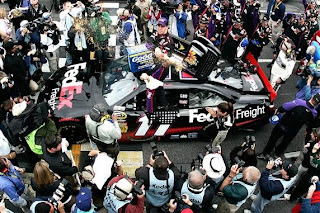 Suppressing the agony of a season-long knee pain, Denny Hamlin used both a fresh set of tires and some considerable muscle to push past Ryan Newman, Matt Kenseth and Jeff Gordon to win the 2010 NASCAR Sprint Cup Goody's Fast Pain Relief 500 at Martinsville Speedway. Rescheduled after a steady rain soaked the Virginia short track event on Sunday, the 500 lap race started noontime Monday running under prominently clear skies. As the green flag fell to the relieved drivers and NASCAR fans, the Goody's Fast Pain Relief 500 started with NASCAR Sprint Cup points leader Kevin Harvick leading. Continuing to hold the lead after the race's first caution period between lap 43 to 47, Harvick's #29 Chevrolet would soon develop a critical mechanical problem. Braking issues would force the Richard Childress Racing #29 Chevrolet behind the wall early in the event. Finishing 35th and 100 laps down, Kevin Harvick is dealt a serious blow in the championship points which would not be completely realized until after the Martinsville race. With the customarily multitude of cautions (13 on this event), the major accident of the afternoon's race occurred on lap 171 when a 4-car mess through turn 3. Elliott Sadler, David Stremme, Paul Menard and AJ Allendinger are involved in the melee. The #26 Ford being driven by David Stremme and well as the #43 Richard Petty Motorsports Ford of AJ Allmendinger suffered the worst damage with both vehicle spewing solids. Through the last half of this Martinsville Speedway NASCAR Sprint Cup race, the first spot was dominated by the #31 CAT Chevrolet of Jeff Burton and the #11 FedEx Toyota driven by Denny Hamlin. Scheduled to have leg surgery on Monday afternoon prior to the Sunday race rain out, Hamlin was experiencing a difficult 2010 Sprint Cup campaign. Before Martinsville, Joe Gibbs Racing's Denny Hamlin had yet to score a single top 10 finish in 5 previous Sprint Cup races. Having won at Martinsville Speedway fall of 2009, the #11 FedEx Toyota was in full-readiness to gain 2010 momentum. 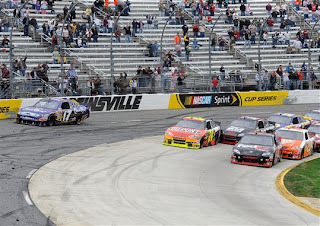 Through the latter laps, Denny Hamlin was leading but determined Jeff Burton was beginning to lean on the #11 Toyota. With under 20 laps to go, the challenge from the #31 Richard Childress Racing Chevrolet would fizzle as a right front tire begin to lose pressure forcing Jeff Burton off the pace. Attempting to soldier on, Burton continued to circulate at a slightly reduced speed several laps until the #31 Chevrolet's tire finally began to shredding. As Denny Hamlin appeared to have an drive to take the famous Martinsville Speedway Grandfather Clock trophy with a 2.6 second lead on teammate Kyle Busch, the caution fell for debris from Jeff Burton's tire. On Denny Hamlin's way to Martinsville Speedway victory lane, his #11 Joe Gibbs Racing crew made a race winning decision which puzzled many. Leading with only a handful of laps remaining, Hamlin's #11 FedEx Toyota came to pit lane with teammate and 2nd place running #18 Toyota of Kyle Busch in tow. Being the only two top 10 cars to make a journey down for four-tire service, the Joe Gibbs Racing cars emerged rejoined the field near the back of the lead lap contenders for a restart just 5 laps to go. With the Martinsville short-track famous for its relatively flat corners and tight quarters racing, it was believed that Hamlin in company with Joe Gibbs Racing threw away victory. With Joe Gibbs Racing Toyotas forfeiting their 1st and 2nd places leaving Hendrick Motorsports' #24 Dupont Chevrolet of Jeff Gordon in the lead. On the lap 496 double-file restart, Gordon masterfully used his front row position to jet out to an uncontested 1st place run. As the #24 Chevrolet skated away, three-wide battles ensued for much of the top 10 positions with the Joe Gibbs Racing #11 and #18 making the hardest charges. While Denny Hamlin was able to push through into 4th by the second last lap, Kyle Busch found himself out of room. Squeezed, Kyle Busch was incidentally clipped by the #98 Ford of Paul Menard through turn 3. Just as Gordon prepared to take the white flag with an well-assured victory, the yellow flag fell as the Hendrick Motorsports Chevrolet was less than 100 feet to the start-finish line. Within the Green-White-Checker finish, Gordon's challengers were better able to pursue the #24 car taking full advantage of Jeff Gordon misplacing his car into turn one. With the clear and present fight coming from front row restarter #39 Chevrolet of Ryan Newman up high, Matt Kenseth pushed his Roush-Fenway Racing #17 Ford aggressively pass Jeff Gordon taking the lead out of Martinsville's turn 2. However, Kenseth's lead would only last down the backstretch as hard charges from Gordon and Hamlin forced the #17 Crown Royal Ford wide into turn 3 and 4. With the door opened, Hamlin out-powered Gordon through the white flag lap taking his second straight Martinsville Speedway NASCAR Sprint Cup win. Joey Logano, the youngest of Joe Gibbs Racing young driver lineup, was inspired by Hamlin's push into the lead following his teammate to take 2nd at the finish line. Jeff Gordon, Ryan Newman and Michael Waltrip Racing's Martin Truex Jr rounded out the top-5 for the Goody's Fast Pain Relief 500. Of other notable drivers, Jimmie Johnson finished 9th, Dale Earnhardt Jr came in 15th, Mark Martin finished 21st and the Busch brothers finished together in 22nd and 23rd position with the younger brother Kyle edging Kurt. Having been in prime shape to steal the race through the Green-White-Checker, Matt Kenseth struggled around to finish 18th place. 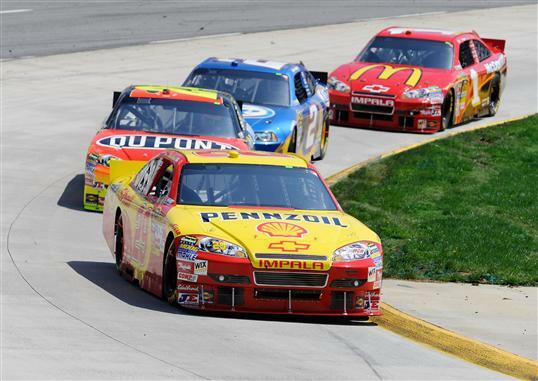 Kenseth has an opportunity to claim the points lead but lost too many positions at the end. Instead, Jimmie Johnson is the current 2010 NASCAR Sprint Cup points leader following the Martinsville event 14 points ahead of Greg Biffle. Taking a week off for Easter, the NASCAR Sprint Cup Series tour will stop at Phoenix International Raceway on Saturday April 10th for the first point-scoring night race of the 2010 season.